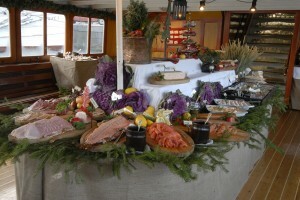 The steamship Blidösund is the original if you look for a cruise in the Stockholm archipelago who offer you the Christmas version of the Swedish Smorgasbord, in swedish called “Christmas Table”. Since 1981 we have offered these cruises from our departure point in front of the Royal Palace at Skeppsbron in Stockholm. The traditional Swedish Christmas Smorgasbord starts with a glass of “Glogg”, the nationally beloved drink of mulled wine. The first course on the table includes cured salmon, pickled herring and other pickled dishes. Then, a second course of cold meets, sliced cheese, cucumbers, and pate is served with hard bread. Next, the traditional Swedish meatballs, different kinds of sausages, and Jansson’s Temptation, which is a hearty and delicious potato gratin. 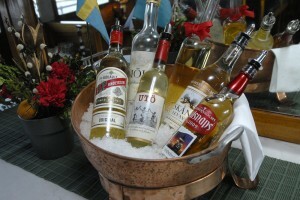 And not to forget; Snaps, traditionally herb flavoured aquavit, we even have our own to offer you! Afterwards, the traditional dessert of rice porridge with cinnamon powder is served,. There are also sweet St. Lucia buns and Ginger cookies. 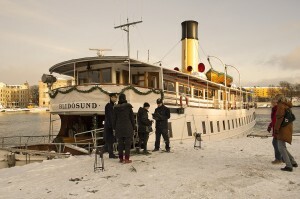 s/s Blidösund runs up to three cruises every day starting from the 29th of November until the 22nd of December. The cruises last for 2 or 2½ hour.